What do kingfishers, Namibian beetles, and humpback whales have in common? Do the members of this unlikely trio serve as the namesakes of professional sporting teams? Have their genes been spliced together to make a super-cucumber? Nope. All three have inspired new human technologies. Kingfishers are expert predators who dive into the water to catch fish. A Japanese engineer was tasked with solving the problem of thunderous claps generated by the Shinkansen bullet train as it emerged from tunnels. He decided to look to nature for answers, and came across the kingfisher, which also must pass from one medium (air) to another (water) at high speed. 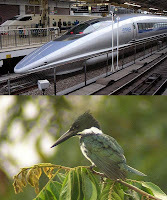 The nosecone of the speedy train was redesigned to mimic the bird’s elongate beak, and the result was not only much quieter, but 10% faster and 15% more efficient in its electricity consumption. A dime-sized Namibian beetle inhabits a harsh desert setting that receives less than half an inch of rain each year. Intrepid biologists found that the beetle meets its water needs with the help of a specially designed shell. Microscopic bumps on the outer surface capture moisture from fog to create water droplets, which then travel along water-repellent channels directly to the animal’s mouth. MIT engineers mimicked this design to create a new, highly efficient water harvesting material that combines a Teflon-like, water-repellent surface with water-attracting bumps. The flippers of humpback whales are lined along the leading edge with irregular bumps, which, at first blush, would seem an odd design for a limb that must maneuver a giant animal through water. However, an enterprising engineer tried adding similar looking tubercles to blades, conducted wind tunnel tests, and found that, among other benefits, the design reduced drag by almost one third. 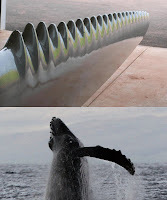 Today, bumpy, whale-inspired blades can be found in everything from wind turbines to HVAC systems to computer fans. I could cite literally hundreds of additional high tech examples founded on Nature’s genius. Don’t believe me? Check out the amazing database at AskNature.org.“Biomimicry” (from bios, meaning life, and mimesis, meaning to imitate), is a nascent, vibrant and rapidly growing field that seeks innovative answers to human problems by turning to Nature. The most famous example is Velcro, inspired by burrs that stuck tenaciously to the canine companion of a Swiss engineer. Contrary to popular belief, evolution is not a random process. It is highly creative, constantly seeking solutions through a trial-and-error process that successfully marries organisms to environments. The core idea of biomimicry is that nature has already solved most of the problems now faced by human engineers and designers. By tapping into these solutions, or “adaptations,” we’re learning to harness energy like a leaf, create color like a butterfly, grow food like a prairie, and recycle our wastes like a swamp. “We live on a wildly diverse planet surrounded by genius,” says Janine Benyus, founder and leader of the biomimicry movement . Got a pressing problem to solve? Just ask nature! The new web home of this movement is biomimicry.net, where you’ll find business applications—people engaged in creating new, sustainable technologies inspired by nature—and a range of education programs (organized within the Biomimicry Guild and the Biomimicry Institute, respectively). Under the new umbrella organization “Biomimicry 3.8” (in reference to 3.8 billion years of life’s evolution on Earth), this entrepreneurial organization has an explicit bias toward ecologically and socially sustainable solutions, steering away from, say, military applications like weaponry and armor. Today, when speaking of cutting edge technology, we often refer to “high technology.” I like to refer to nature’s technological solutions as “deep technology,” the result of evolutionary R&D conducted over billions of years of deep time. My strong hunch is that the future “sweet spot” of technology will be at the interface of high-tech and deep-tech. Here we will eventually learn to model not just our materials and gadgets, but entire societies after Nature’s wisdom. In such a place, buildings would behave like trees, grabbing energy from the sun and regulating temperatures without expensive heating and cooling. Such innovations are already well underway in the world of architecture. Ultimately, linked to networks of other buildings, both homes and businesses, cities could become much like ecosystems, funneling local resources where they’re needed and using the waste from one sector as the raw materials of another. This would be biomimicry scaled up to civilization proportions. A dream? Yes, but a glorious and attainable one. A few weeks ago, I had the pleasure of attending a day-long education workshop spear-headed by the Biomimicry Institute. I was fascinated to learn how fast and how deeply this young field is making inroads into K-12 and higher education. I was also impressed by the passion of biomimicry practitioners. A number of pioneering teachers are quickly finding ways to place biomimicry at the heart of the curriculum. Today, you can even attain a masters degree in this area. No question. Biomimicry is a powerful lens through which to view science education, encouraging children and adults to new creative heights inspired by the nonhuman world around them. Nevertheless, what excites me most about biomimicry is the revolutionary shift in perspective it leads us toward. No longer merely something to learn about, the living world is suddenly transformed into something to learn from. No longer merely a bunch of material resources, Nature becomes mentor and model. Deep technology and biomimicry are potent tools that unite the evolutionary epic with a sustainable future, helping us navigate our way back to a home fully embedded within the natural world. 1. Benyus, Janine (1997). Biomimicry: Innovation Inspired by Nature. New York, NY, USA: William Morrow & Company, Inc. Welcome to The Whirlpool of Life! The Whirlpool of Life is a blog about nature. It’s about how the living world works and how we perceive it. It is also much concerned with deep time and our relationships with the 99% of “earthlings” that are now extinct. Posts will encompass a wide range of topics, spanning paleontology, evolution, ecology, education, sustainability, philosophy, and psychology. 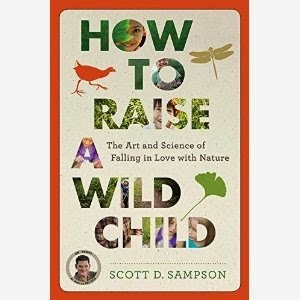 In most cases, the thread that I will use to weave these topics together is the transformation of worldviews, particularly through connecting children with nature. A foundational essay for this blog can be found by clicking here. I am a dinosaur paleontologist, science communicator, and educator. I serve as Vice President of Research & Collections and Chief Curator at the Denver Museum of Nature and Science. Alongside my dinosaur research, I now spend the bulk of my time working to bridge the human-nature disconnect. I am currently working on a general audience book for Houghton Mifflin Press about how to connect children with nature.